Sheet pan dinners are a favorite of mine, not only for their easy clean-up, but also because they’re the perfect blank slate for creating last minute healthy meals based upon whatever ingredients you have on hand. If you enjoy Greek cuisine as much as I do, trust me—you’ll love the Mediterranean inspired flavors in this dish! Naturally gluten free potatoes pair together deliciously with the lemon, garlic, and oregano infused chicken, but feel free to omit them for a lower-carb meal, or add in some extra veggies like green beans, asparagus, or broccoli—the sky’s the limit! Combine olive oil, lemon juice, minced garlic, 1 teaspoon oregano, salt, and pepper in a large ziplock bag. Place chicken breast pieces in bag with marinade, seal, and place in refrigerator for 30 minutes or longer. Preheat oven to 350F, and line a baking sheet with aluminum foil. 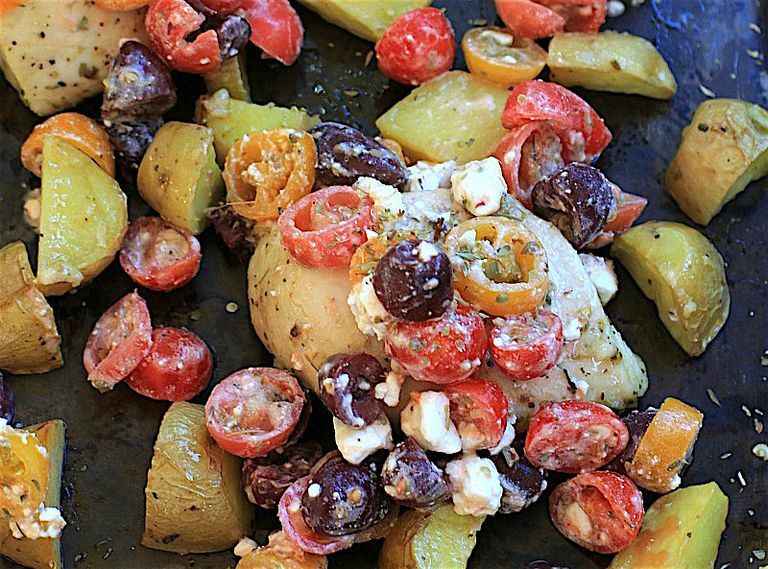 While chicken and potatoes are cooking, make the Greek salsa by combining the sliced tomatoes, crumbled feta cheese, chopped olives, and remaining 1 teaspoon of oregano. Keep covered in refrigerator until ready to serve. When chicken and potatoes are done, divide between 4 plates, and top with Greek salsa before serving. This gluten-free sheet pan chicken and potatoes are easily made low FODMAP by omitting the minced garlic and adding 1 teaspoon garlic oil to the marinade instead. Infused oils, such as garlic oil, don't contain the FODMAPs that the whole food does. Fresh oregano is delicious in place of the dried oregano. As a general rule of thumb, use 1 tablespoon fresh herbs in place of 1 teaspoon dried herbs. To save time, the chicken can be marinated overnight or in the morning, and the salsa can be made ahead of time and stored in the refrigerator for up to 3 days.